Love this image, snagged off The Scooterist blog of a custom SX. 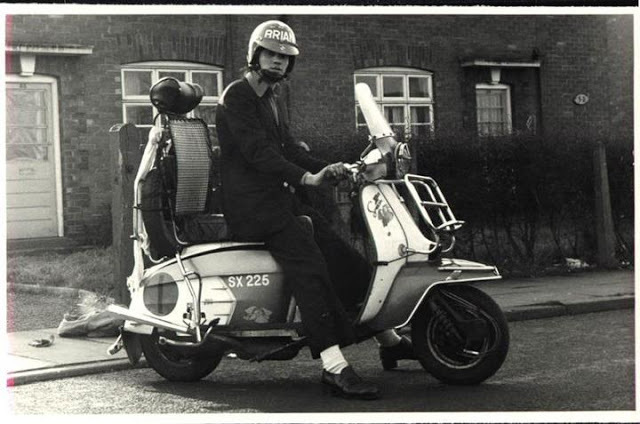 I’d peg it as a guy in a transitional “hard mod/suedehead” phase, the scooter, though full bodied is starting to bear the hallmarks of the later “Skinhead Skellie” style, with the high rise, basketweave seat and headrest, the scarf tied on, and the megaphone exhaust. A good look Brian! This entry was posted in Lambretta Imagery, Lambretta Life and tagged black and white, imagery, images, Lambretta, photography, Suedhead, SX, vintage by crocodilejock. Bookmark the permalink.